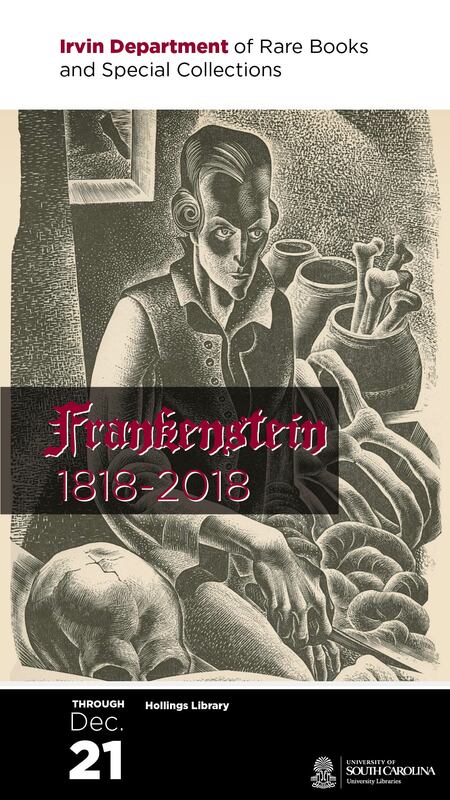 Frankenstein: 1818-2018 is an exhibit centered on an original first and revised third edition of Mary Shelley’s revolutionary novel. Drawn from the holdings in the Irvin Department of Rare Books and Special Collections at the University of South Carolina, the emphasizes Frankenstein’s literary and scientific backgrounds and traces its visual reinterpretations. The exhibit includes significant editions of works by other Romantic-era authors including a first edition of William Wordsworth and Samuel Taylor Coleridge’s Lyrical Ballads, Coleridge’s “Rime of the Ancient Mariner,” and a vampire tale by Lord Byron. Also on display are an original edition of John Milton’s Paradise Lost, a selection of Mary Shelley’s other works, texts from the history of science, and illustrated editions of Frankenstein by Lynd Ward and Barry Moser.